A head-on accident with a drunk driver going 70 miles an hour left 20-year-old Hal Elrod considered dead for 6 minutes. Though he was revived, he still suffered 11 broken bones and doctors told him he would never walk again. Mr. Elrod overcame all these obstacles by age 30 to become a husband, father, author, international speaker, a Hall of Fame business achiever and a 52-mile ultramarathoner. In his book, “The Miracle Morning,” he shares with readers his tips for successes. I have researched what successful people do in the morning and have comprised a list from various sources, but before I share it with you, I want to say that as a nurse, I loved working evenings because I could get up, exercise, go to lunch and have time for me before I start my work day. Now, I still do the same only just a little earlier. Once you hit the floor, your time is not your own. You are being constantly bombarded by stimuli and are there to totally serve patient’s needs. If you wake up 1 hour earlier a day, you will have 9 extra 40-hour weeks in the year! Wow! Think about it. 9 extra weeks! It’s amazing. We all have the same number of hours in the day. It’s what we do with our available time that separates us from others. Now, one thing not to do first thing in the morning is to check your emails. When you check them (I plead guilty) right off the bat, then you are on everybody else’s agenda and not your own. You’ll find yourself busy responding to everybody else’s needs. Begin your morning in silence or meditation. I like to meditate on feeling connected to the Earth, my family, my city and country. I then focus on gratitude. I forgive anybody that I have said something to which may have offended them or for any wrongs that I may have brought anybody. I visualize what I want to occur in the future and my daily intention for the day. I then ask the universe for support, give me energy, guidance and protection to fulfill my perfect day. Some people read affirmations for things that they want to change in their life. Or they just read positive statements to get in a positive vibe. Some visualize in their head what they want their life or just that day to look like. Many people read in the morning. Reading a book that will get you into a positive vibration or help you with your personal growth or career. Some write in a journal about their life and career or they may journal what they’re grateful for. The number 1 tip that many successful people will do is to get up early and exercise. I know it’s not an easy task to do first thing in the morning, but once you complete it, you’ll feel great the remainder of the day and have no excuses for not exercising later. Another good tip is to eat a healthy breakfast and to hydrate. That cannot be understated. Having a good healthy breakfast gives you the energy to get through your day. And, as we know as nurses, a lunch break is really a bonus. I always set my intentions for the day so I know ahead of time what I want to complete. Sometimes, first thing when I wake in the morning and am able to focus with no distractions, I will finish difficult tasks that I have been procrastinating over. Another morning routine is to spend quality time with your family or your spouse. 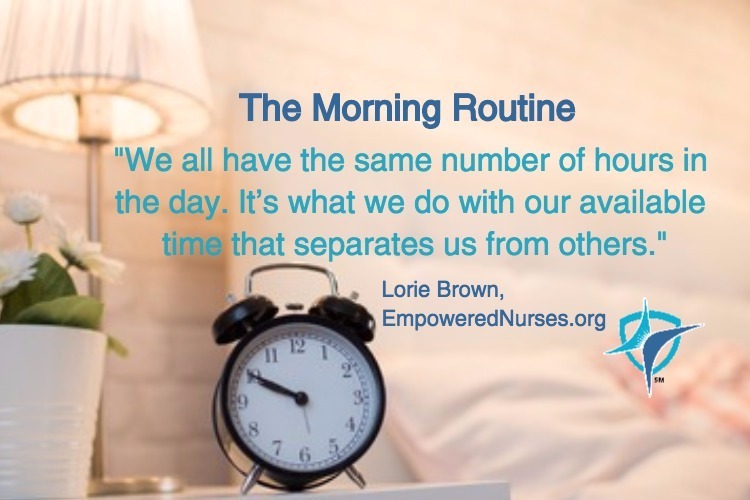 This cannot be underestimated given that nurses are away for considerable amounts of time while working their shifts. What do you do for your morning routine? How do you take care of yourself? How do you energize yourself before you start your working day? Remember you have to fill your cup first before you can help others. I look forward to hearing your thoughts in the comments below.